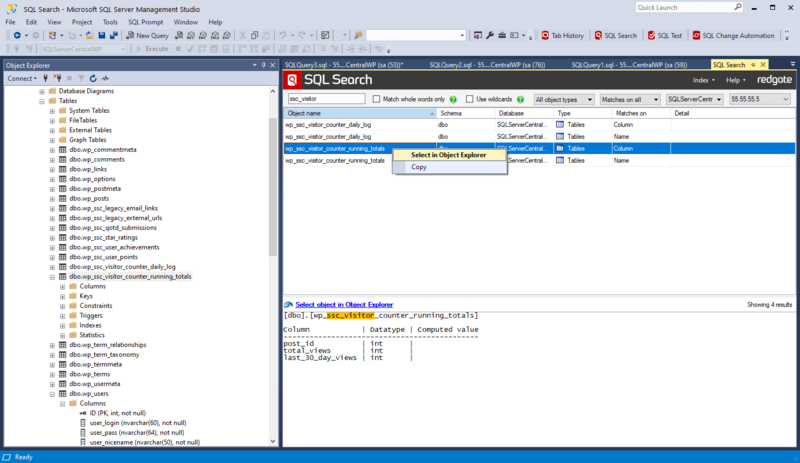 SQL Search is a free add-in for SQL Server Management Studio and Visual Studio, that lets you quickly search for SQL across your databases. You want to rename one of your table columns but aren't sure what stored procedures reference it. Using SQL Search, you can search for the column name and find all the stored procedures where it is used. 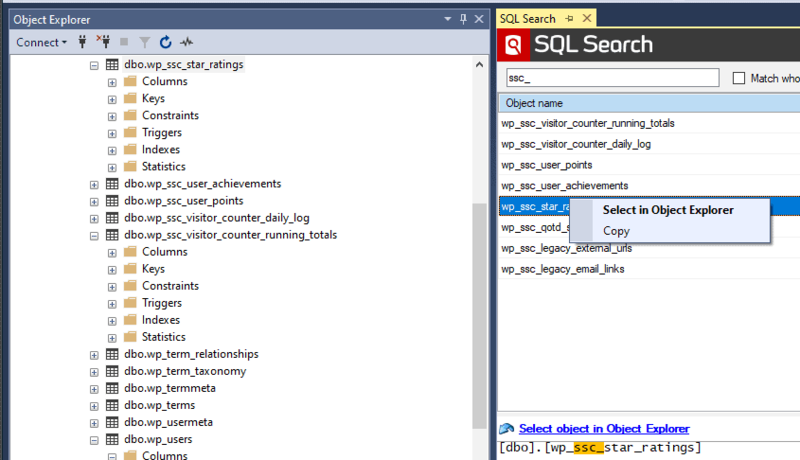 Finding anything in the Object Explorer requires a lot of clicking. Using SQL Search, you can press the shortcut combo, start typing the name, and jump right there. You need to find stored procedures you've not yet finished writing. 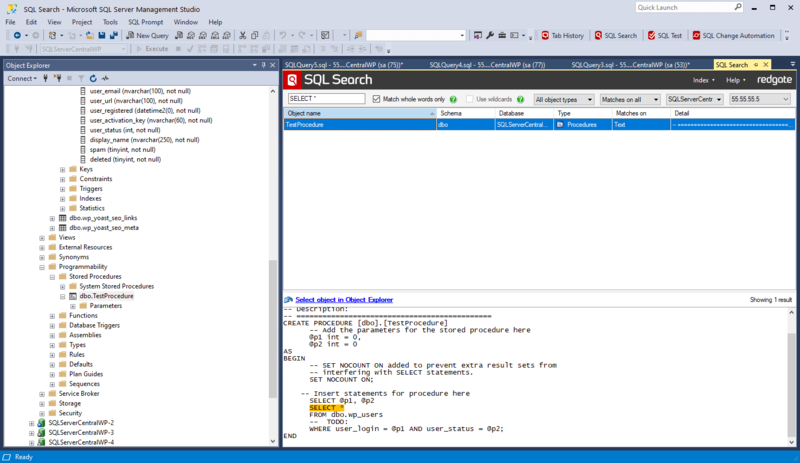 Using SQL Search, you can search for stored procedures containing the text TODO. 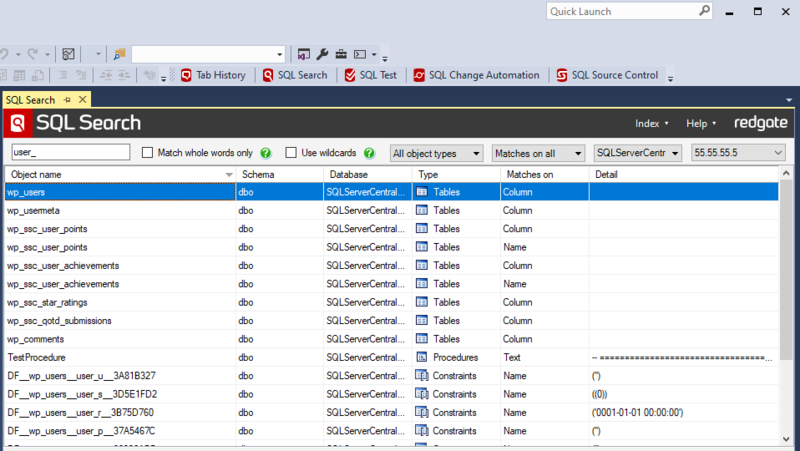 Using SQL Search, you can look for SELECT * in the text of stored procedures and views and replace them with a correct list of columns to improve performance and prevent future bugs. “When a database contains several hundred objects, it can be a pain finding the correct table or remembering the name of an obscure stored procedure. “Management, in their infinite wisdom, decided that changing the Station IDs, so we could assign a block of them to vendors, was a good idea. This rendered many of my processes basically dead, because my WHERE clauses were of the form WHERE STID = x. Suddenly, nothing was getting returned and a lot of automation stopped. I had over a hundred procedures affected. “We have had the occasion to move databases to a new server. SQL Search would make it easier to find all of the instances where the previous server was mentioned by name and correct them. 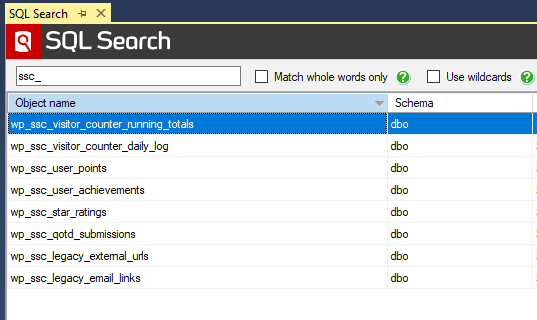 See why Chris Yates relies on SQL Search to search through objects in his 1500 databases. 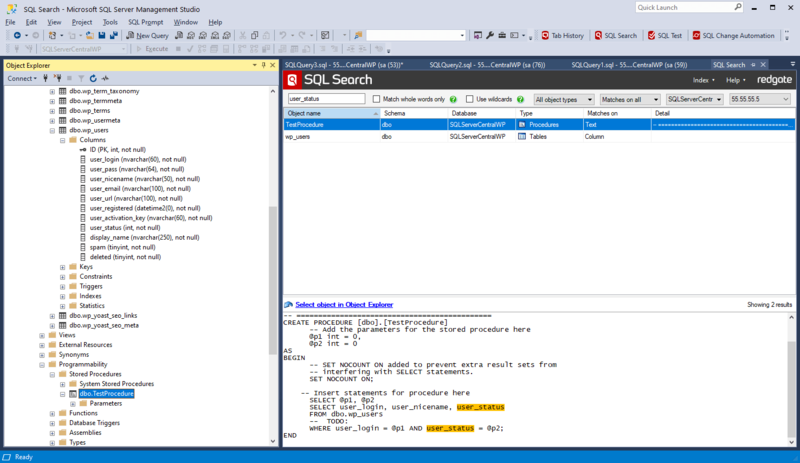 SQL Search is a free add-in for SQL Server Management Studio that lets you quickly search for SQL across your databases. 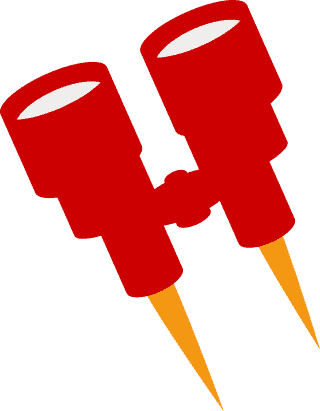 Write SQL twice as fast & deploy changes in minutes, with the industry-standard products for SQL Server development, deployment, backup, and monitoring.